Yes, we do have a garage. And yes we have been able to park the cars in there, but we have had so much “stuff” here, there and the next place, that it is sometimes difficult to find things. Since my son purchased this shelf unit and didn’t want to take it apart, he gave it to me. And more shelves are usually good. 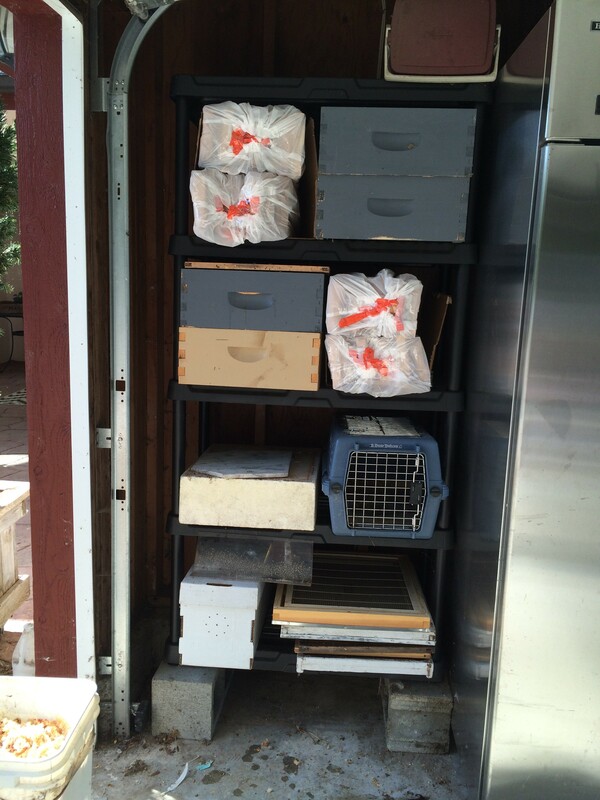 All my extra bee frames are in plastic bags and the boxes fit 2 high, there is a place for the tops and the bottoms. I am one happy person with these all in one corner. we cleaned more of the garage, but if I could just let go of the fish tanks that I think I still want to use someday and the bikes that the boys have outgrown, I’d have even more room in the garage. I need to find just the right family who needs the bikes – someone who couldn’t afford them otherwise.